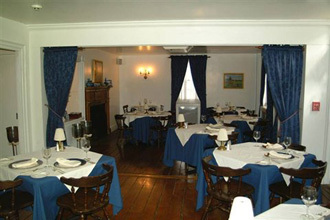 Adrienne's provides fine American dining in an exquisite location. Located just a short drive from New Milford town center, Adrienne Restaurant is an oasis of calm, perfect for a quiet dinner for two or a gathering of friends. The decor is simple but elegant with fireplaces in both dining rooms and perfect lighting adding to the ambiance. In the summer months, the outdoor patio provides for al fresco dining. 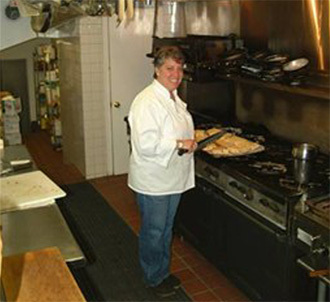 Owner and head chef Adrienne Sussman opened the restaurant in 1996 and it is easy to see why it has been such a success. The staff are friendly and attentive without being overbearing. There was an abundance of lobster in the Maine Lobster Risotto with Asparagus and Fresh Basil. The cream based sauce was perfectly balanced allowing the flavor of the ingredients to shine through. ($14.95). The Garden Fresh Tomatoes with Fresh Mozzarella, Fresh Basil and Garlic Oil, is an Italian classic, but the version served here must be complimented on the flavorsome tomatoes and light yet creamy mozzarella. Sublime. ($9.95). Sautéed Breast of Duck with Blackberry Port Wine Sauce, Sugar Snap Peas and Brown Rice leapt off the menu. All the elements combined perfectly, with the duck tender and the sugar snap peas crunchy but not undercooked. The sauce was a delicious delight that perfectly suited the duck breast. ($26.95). The special of the day was Potato Crusted Salmon with Steamed Asparagus and Pommery Mustard Sauce. The salmon was cooked medium rare retaining its moisture and the crunchy gratin potato topping an inspirational counterpoint. Any fears that the mustard sauce would overpower the salmon were completely unfounded such was its lightness of touch. The Caramel Custard Flan was simple and all the better for it. Perfectly cooked with vanilla pods bursting into life. The Dark Chocolate Mousse with Crisp Almond Cookies and Raspberry Puree was a hit with its rich velvety texture perfectly accompanied by the raspberry puree (both $8.95). 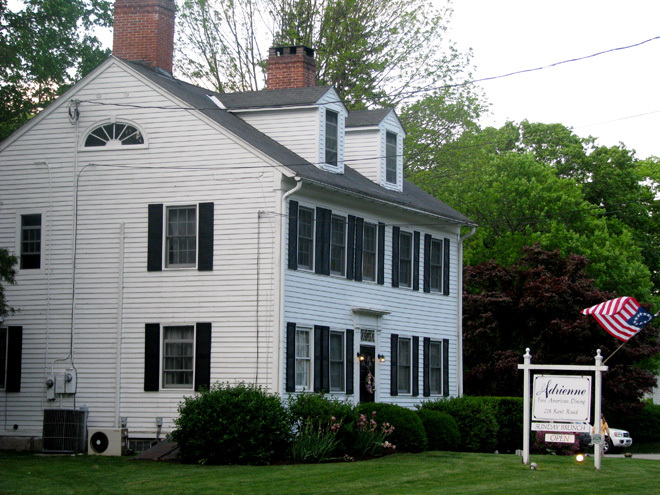 The Fine American cuisine served at Adrienne's is, without doubt, amongst the very best in Connecticut.